“The Fourth Way” is the title of a 1957 book by Russian esotericist P. D. Ouspensky that is supposed to be about the self-development methods of the mystic/philosopher/teacher G. I. Gurdjieff. Ouspensky was a student of Gurdjieff for a significant part of his life until there was a parting of the ways. This book was published after Ouspensky died in 1947. A substantial amount of it is constructed in questions and answers, as a teacher might answer their student’s questions. Ouspensky’s first book in 1909 was about the fourth dimension, which was much in the public consciousness in the first few years after Einstein published his theory of special relativity. His second book was titled “Tertium Organum”, or the third canon of thought, after Aristotle’s first and Francis Bacon’s second. Ouspensky’s third book “A New Model of the Universe” continued in this way, linking science with spirituality, or at least consciousness. What is a person or what are the aspects of a person? Is a person a machine? A physicalist thinks that a person is their body, and the mind is what the brain does. 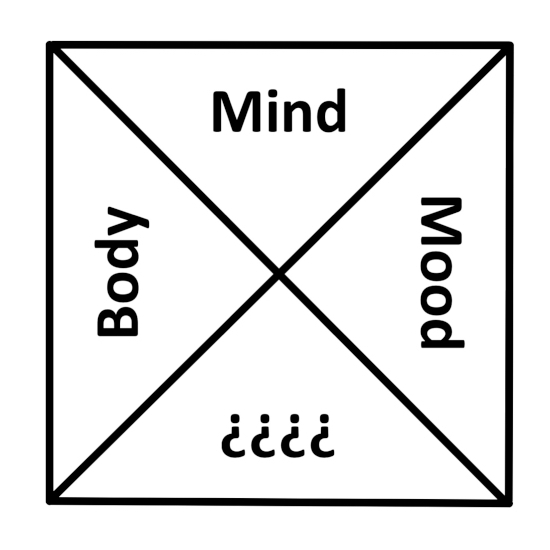 A dualist thinks that a person has a body as well as a separate mind, but we know that the mind is dependent on the body for operation and it can be diminished by injury, neglect, or abuse. There are other aspects of the person, such as the emotions or “heart”, which are somewhere between the body and the mind. And if you search on the web, “soul” or “spirit” are often shown in images along side body, mind, and mood, but these terms are imprecise. Sometimes soul is defined as spirit, sometimes spirit as soul. It is difficult to determine what is meant by them, but they are usually of a higher-order nature than the physical or mental or emotional. It is usually what remains the same for a person, the still point of a changing self, regardless if that endures after death. Various schools of spiritual people concentrate on the control and discipline of different aspects of the self: the physical for the Fakir, the mental for the Yogi, and emotions for the Monk. These are the first three historical ways for self-development, but they require separation from the normal social world, and neglect the other aspects of the self. The Fourth Way was said to require no extreme separation, and to develop body, mind, and mood in a balanced way. Gurdjieff thought that most if not all people were machines because they were “asleep at the wheel” (my metaphor), the wheel being the control of their own consciousness. Similar to the practice of lucid dreaming, these teachings (also called “the work” or “the system”) purported to develop the conscious self into something much more than ordinary awareness. This aware self would have access to all sorts of abilities that remain hidden or dormant in most of us. The Fourth Way is also said to be the way of the “sly man”, but to be sly is to be crafty, cunning, and tricky. If you are sly you are deceitful or a charlatan, dishonest and evasive, a “rogue”. You take advantage of people, or you game the social system. Are there any truth to these teachings, or were they merely a way that Gurdjieff found to make an easy living? If not, why call it the way of the “sly man”? On the other hand, who doesn’t want to develop their best selves in the most efficient and clever way? I also read that “sly man” is a translation of the French “le ruse”. The idea behind this name is for a person that takes advantage of opportunities in their normal life to development their awareness, rather than just their attitude towards others. And so it’s a posture towards the broader world, not just towards people. If I had a short word to substitute for “rogue” in the above diagram, I might do so, to prevent the negative impression I might be giving. But the term “rogue” is probably less offensive that it used to be, so I’ll keep it for now. Yet people do love to be deceived. They love to be entertained, and they love a good story with charismatic characters. They also love to hear what they want to hear. Perhaps that’s all these teachings really were and are. And yet, many artists, writers, and thinkers have embraced the ideas of this fourth way. Certainly to enhance one’s consciousness is a positive thing to do, or to eliminate erroneous or harmful thought, or to “know thyself”. Socrates taught that “the unexamined life is not worth living”. Perhaps there is some worth to these teachings after all, but a person may have to determine this for themselves. What happens when the fourfold of Noether’s Theorem is spliced together with the fourfold of Pauli-Jung? Both have Space-Time and Matter-Energy. The former has Conservation and Symmetry, and the latter has Causality and Synchronicity. And if Space-Time and Matter-Energy are both divided into Space and Time and Matter and Energy, one obtains this eight-fold. Causality means that some action or cause in time (say a process) of things in space can have an effect (another process, say) on different things in space, and Synchronicity means that different events (say processes) separated in space can have non-causal relationships between them. Conservation means the consistency of a quantity of matter or energy or matter-energy through time, and Symmetry means the consistency of a measure of a structure or form through space. I am reminded of my fourfold Four Bindings, consisting of Chains, Grids, Blocks, and Cycles. 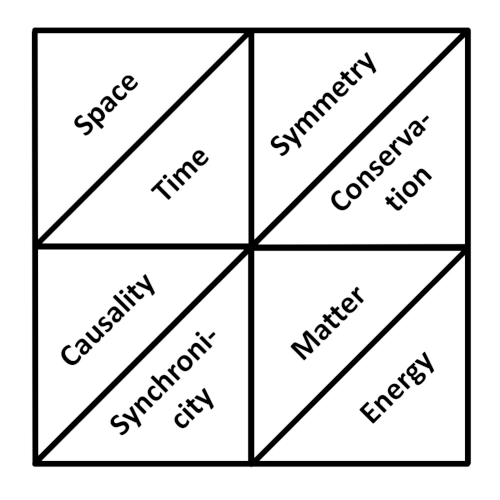 Causality and Synchronicity are Chains (or non-chains for the latter) Space and Time are Grids (or flexible meshes), Matter and Energy are Blocks (or chunks of stuff), and Symmetry or Conservation are Cycles (of the group-theoretic kind or the equivalence class kind or just loops). 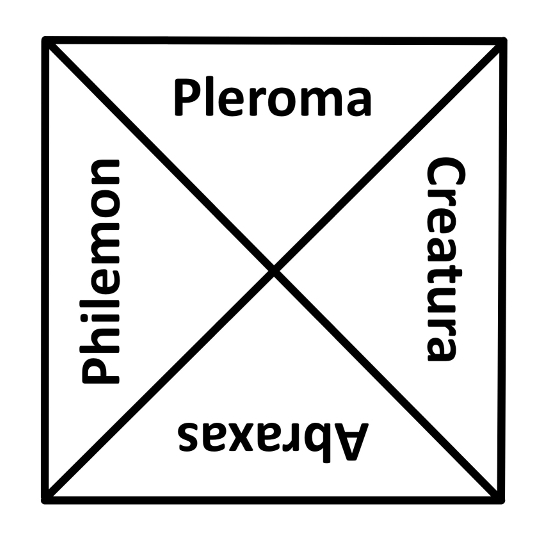 This is a reworking of a previous six-fold diagram that I believe is served better as an eight-fold. 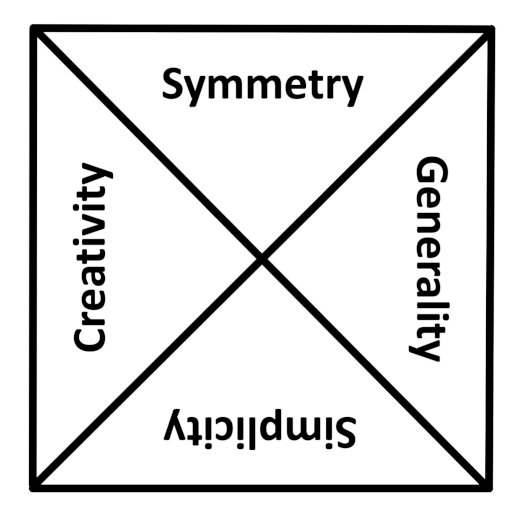 Guided only by their feelings for symmetry, simplicity, and generality, and an indefinable sense of the fitness of things, creative mathematicians now, as in the past, are inspired by the art of mathematics rather than by any prospect of ultimate usefullness. A smile fell on the grass. 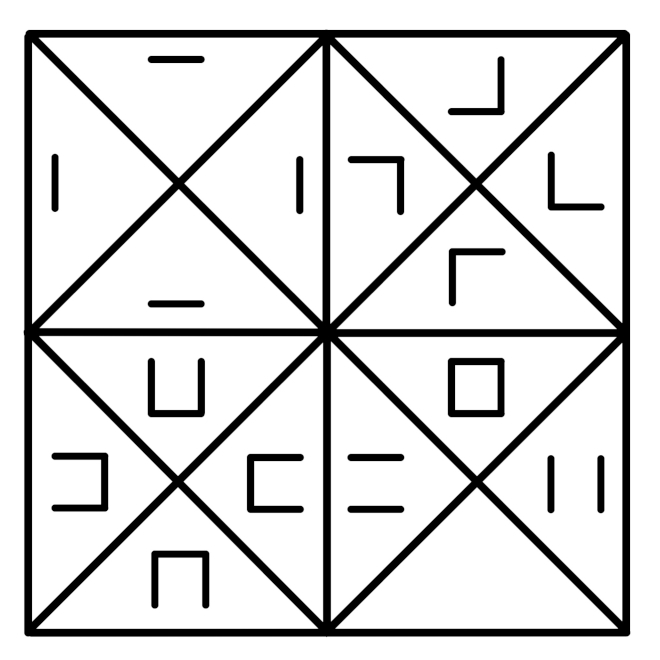 Here is another identity but this time corresponding to an eight-fold: the Eight-square identity of Ferdinand Degen found about 1818. You know the drill: it states that a product of two numbers that are each the sum of eight squares is itself the sum of eight squares! Note that the expressions above have an interesting symmetry, aside from the one on the upper left. 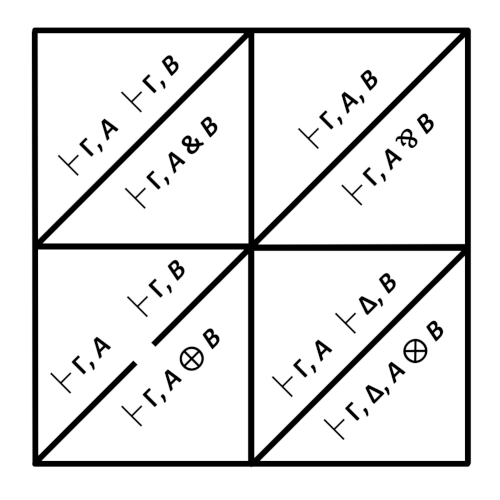 Indeed, Euler’s Four-square Identity has a similar simpler symmetry. 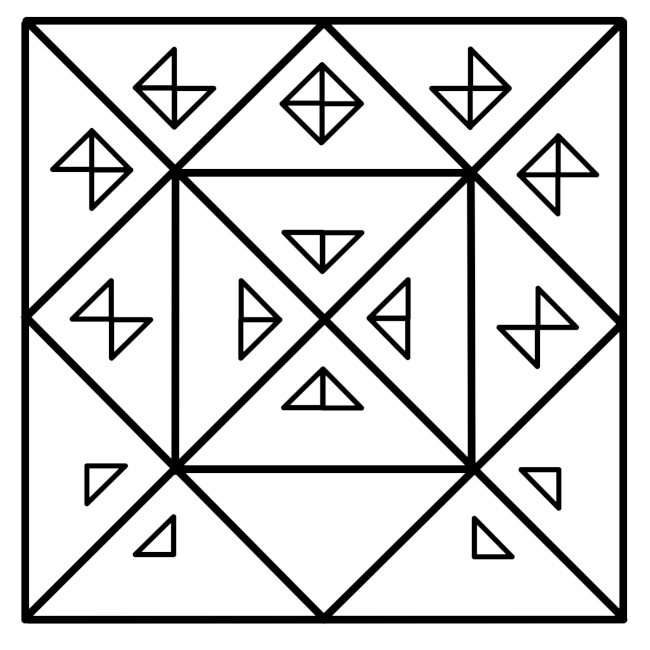 There is also a connection with Octonions if you are interested in digging for it. 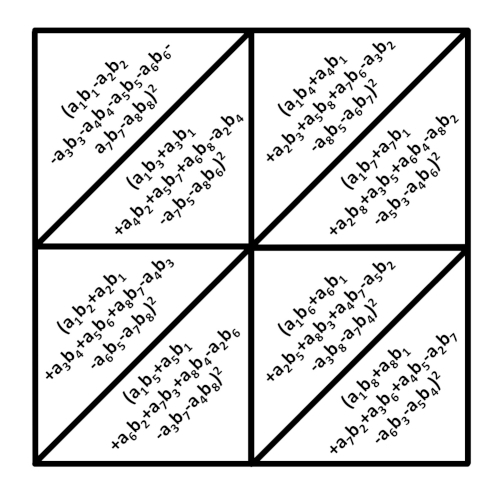 If you are anticipating that there is such a formula for sums of sixteen squares, there is, but not a bilinear one, and it is much more complicated! Here’s a nice little math identity that mathematician Leonard Euler wrote down in a letter dated 1748. 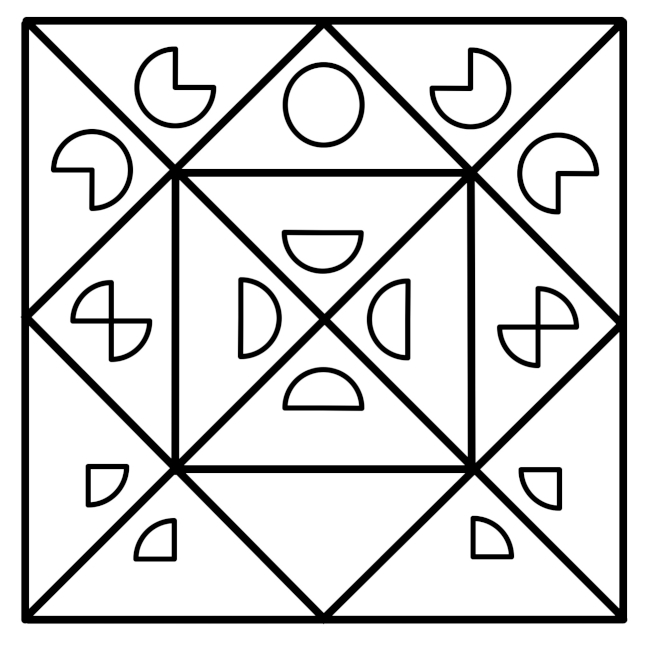 It states that the product of two numbers that are sums of four squares is itself the sum of four squares. It can be proved with elementary algebra or even by quaternions! This is a continuation of my last entry. 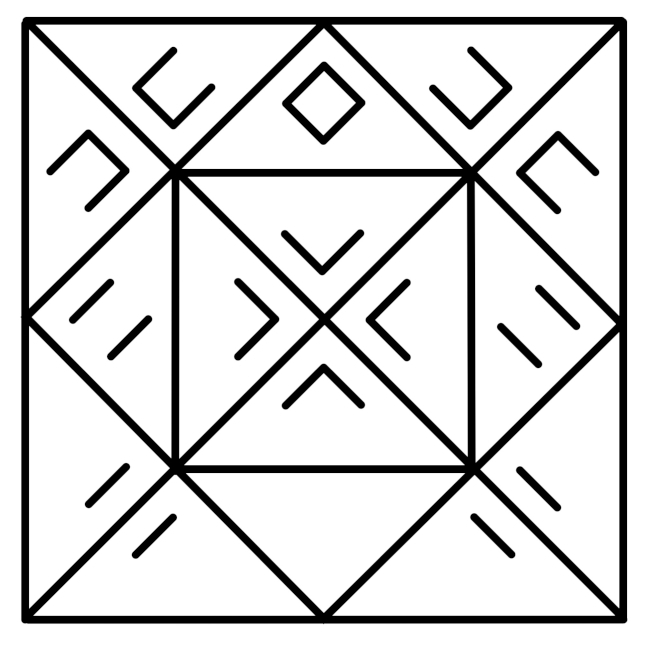 Above is a different representation of the LICO alphabet, with the letters turned 45 degrees counter-clockwise, and rearranged into a symmetric pattern. The letters seem to arise more naturally in this orientation, but then Schmeikal rotates them into his normal schema. 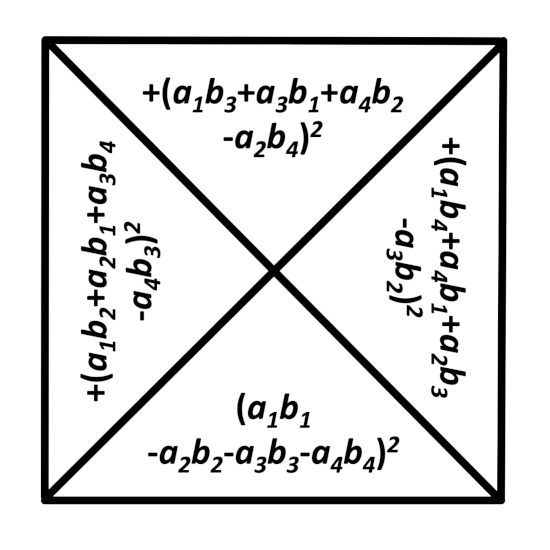 And to the right is a diagram of the logical expressions that correspond to the letters above. After making these new diagrams, I became inspired and made a few other figures to share with you. How could I not love a paper with this title? I’ve struggled with it for a bit, and I’ve only managed a couple of diagrams relating the author’s LICO (Linear Iconic) alphabet made up of 16 letters. However, I see that there are a few other papers by Schmeikal available on ResearchGate that look easier to understand. But also however, the first one says to read the “Four Forms” paper first! 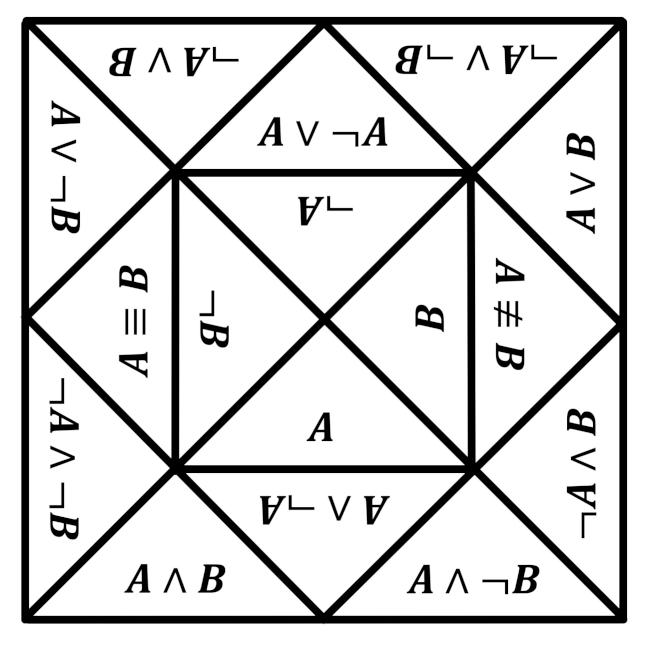 At any rate, I present a sixteen-fold of the LICO alphabet, and another of the binary Boolean operators that are in a one-to-one mapping with LICO. There is much to understand from these papers, including much syncretism between various mathematical sixteen-folds, so please forgive me if I don’t explain it all with immediate ease. However, I believe it is well worth the effort to understand. 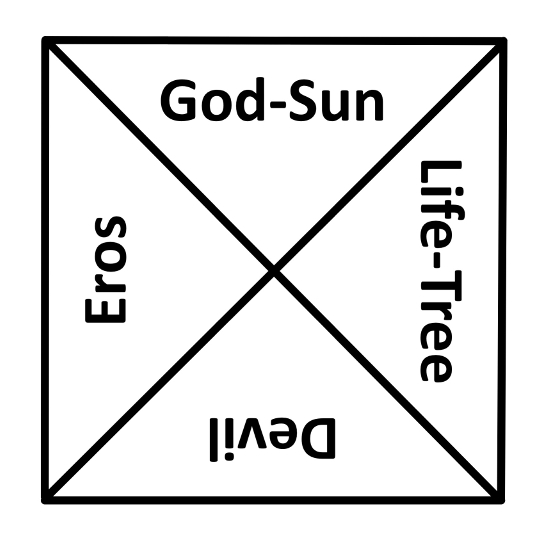 The title comes from the result that four elements of LICO can reproduce the other twelve via linear combinations. 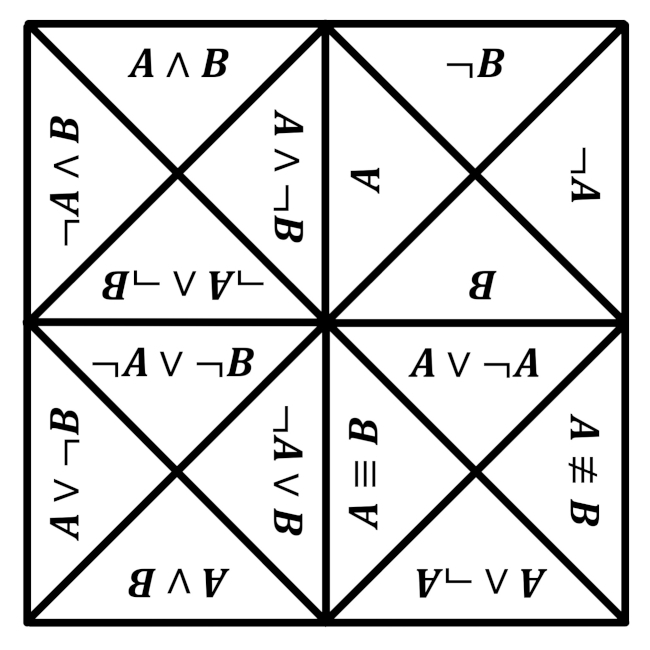 These four forms are the Boolean True (A or ~A), A, B, and A=B. 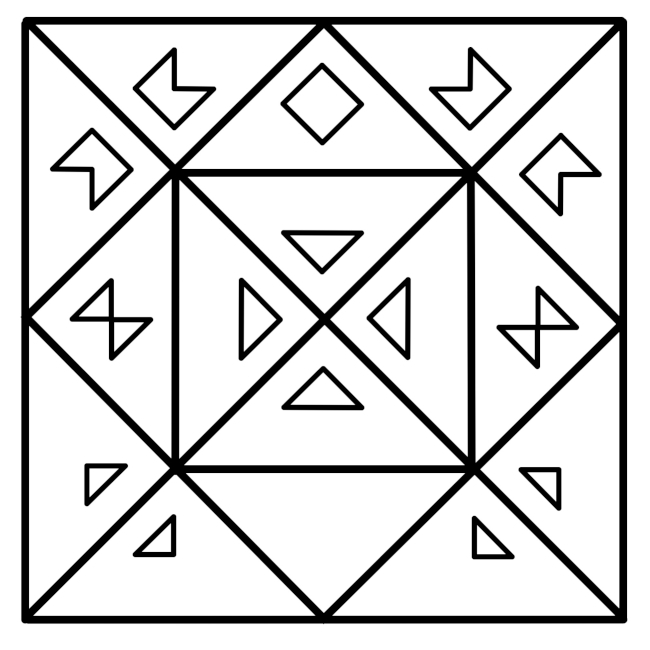 These are within the interior right-hand triangles in the LICO diagram. Of course, it is well known from Computer Science that the NAND operator (~A or ~B) can also generate all other fifteen operators, but this is by multiple nested operations instead of simple Boolean arithmetic. There are several other “universal” binary gates that can do this as well. 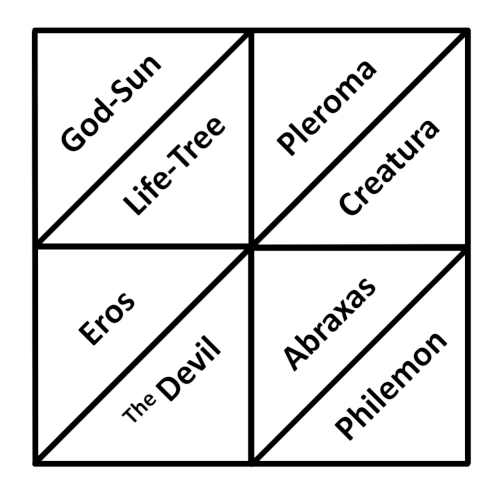 Two other representations that have four elements that can generate the other twelve via linear combinations come from CL(3,1), the Minkowski algebra. 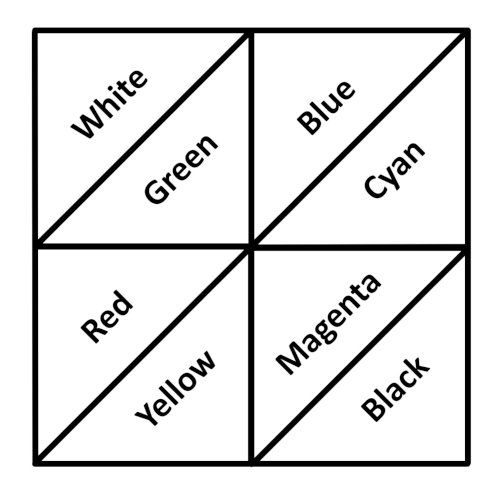 These representations are called “Idempotents” and “Colorspace vectors”. Because of this algebra’s association with space and time in relativity, Schmeikal claims that LICO has ramifications in many far-ranging conceptualizations.